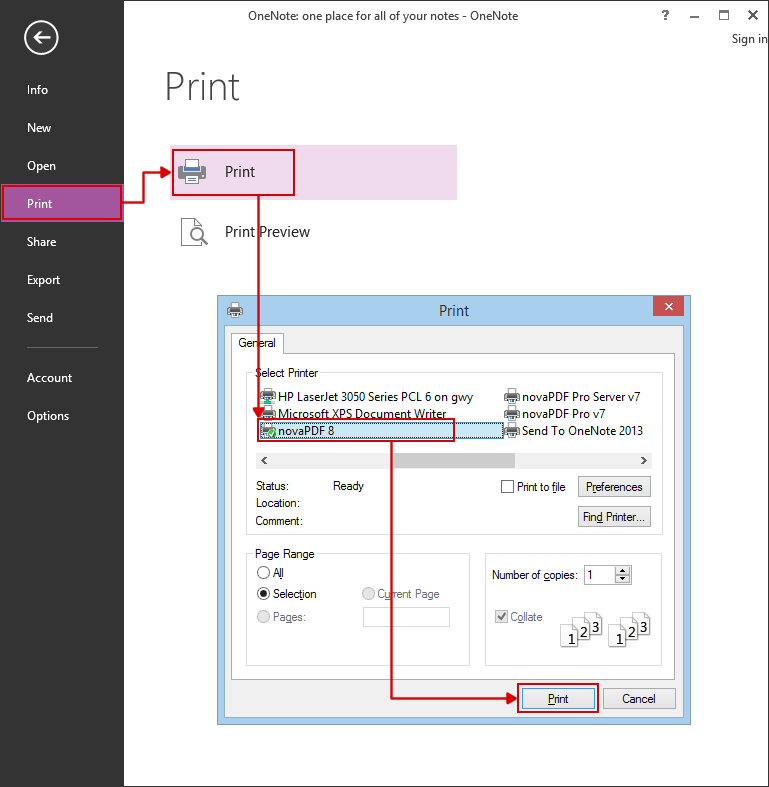 This tutorial shows how to convert the proprietary Microsoft Office OneNote file format (.one) to a PDF document with novaPDF as well as advantages and features when using the novaPDF as a PDF printer driver. If you don't have novaPDF installed, use the Download page to download and install it. Microsoft Office OneNote is an application for free-form information gathering, available either with the Microsoft Office suite or as a separate installation. OneNote is especially well suited for use on pen-enabled Tablet PCs, in environments where pen, audio or video notes are more appropriate than an intensive use of keyboards. OneNote's application format (.one) is proprietary, which means it can only be managed by the Microsoft OneNote application, without any other separate viewers or editors available to support the format. Regarding file version compatibility when sharing, the other users must have the same OneNote version installed as the user sharing the .one file, as OneNote 2003 version cannot open files created with OneNote 2010 or OneNote 2013. Furthermore, in case of a OneNote version upgrade, all the old notes and books created with previous versions will be upgraded to the newest version. 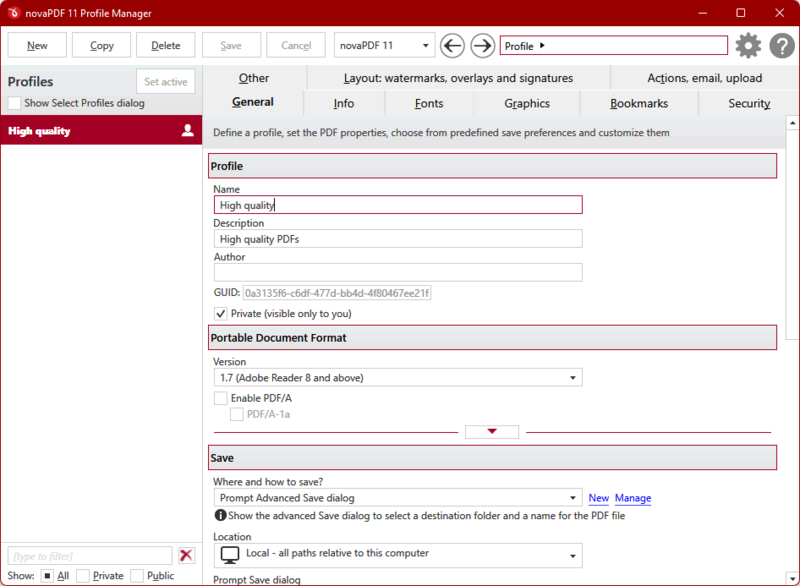 Also having your OneNote file in PDF format is an advantage regarding document interactivity and popularity (PDF files can be read and saved on virtually any computer and offer support for a wide range of system platforms) and standardization (PDF is an ISO standard for document sharing and archiving formats PDF/A). You do not need to worry about PDF software versions or any other compatibility issues when sharing or saving your PDF files. OneNote 2013 is a much more robust application than its predecessor and it has been reworked and extended for better free-form note-taking and information organization. The list of printers will be shown, select novaPDF from those available. Optionall you can click the Preferences button to adjust novaPDF's specific features if needed (adding document information, setting encryption, setting bookmarks, adding watermarks, setting up e-mail sending options etc.). OneNote 2010 is the latest version of the Office OneNote application, developed for taking notes, adding audio, images and organizing information. Download novaPDF from our Download page and install it on your computer. Press the Print button, select a location to save the PDF file, enable any Merge with PDF options and/or After save actions if needed and click OK. The OneNote file will be converted to PDF and will contain the features previously added. This tutorial shows how to convert the proprietary OneNote file format to PDF using novaPDF with OneNote 2010 and 2007 editions. It also highlights the advantages and features you can have by using novaPDF to convert your .one files. 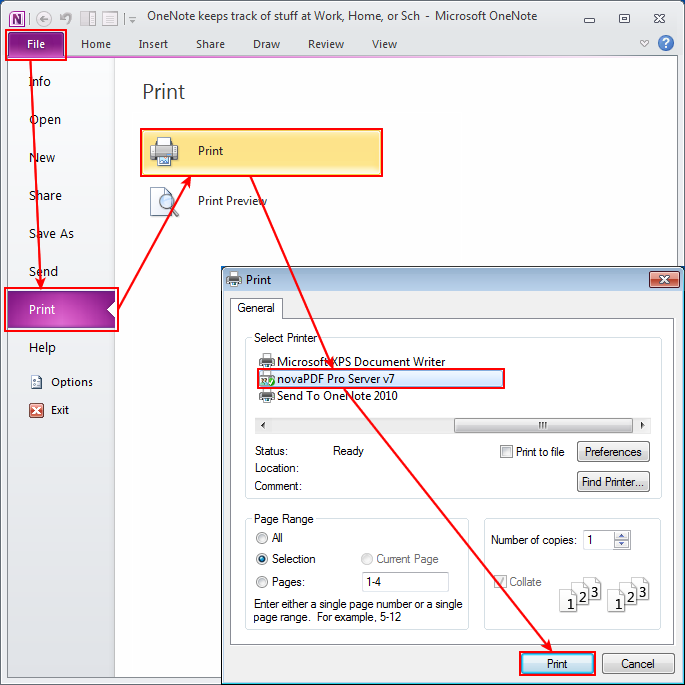 This tutorial shows how to convert the proprietary Microsoft Office OneNote file format (.one) to a PDF document with novaPDF as well as advantages and features when using the novaPDF as a PDF printer driver. If you don’t have novaPDF installed, use the Download page to download and install it.